CONSTRUCTION • Upper constructed from innovative, abrasion-resistant microfiber with synthetic polymer on toe box. Main microfiber material offers high levels of water-resistance, durability and improved weight-saving. Material ensures consistent fit for long term usage and is easy to maintain and clean. • Contoured advanced polymer core structure envelopes upper boot for structural integrity and abrasion resistance while allowing excellent levels of controlled flex. • Medial-facing biomechanical pivot system links lower and upper parts of the boot and gives front and rear flexibility and structural support. Both the inward-facing upper and lower panels are constructed from specifically formulated polymer with grip sculpture patterning for maximum contact with bike and improved abrasion resistance. PROTECTION • The Tech-5 boot is CE certified. • Anatomically profiled, high modulus polymer shin plate for superior impact and abrasion resistance. The contoured shin plate allows for greater range of fitment and features a Velcro® adjustable panel for a personalized and secure closure. • Innovative one-piece TPU injected dual compound foot shell with excellent impact and abrasion resistance and unmatched levels of safety. This shell is reinforced by a metal shank inside and toe reinforcement co-injected in harder compound. • The TPU heel patch connected with shell and lateral/medial TPU parts, offers protection and support. • Soft poly-foam surrounded the ankles and collar offer shock absorbing performance, plus full interior textile lining for comfort. KEY FEATURES • Redesigned instep and Achilles accordion flex zones made from lightweight microfiber for superior comfort, control and support. 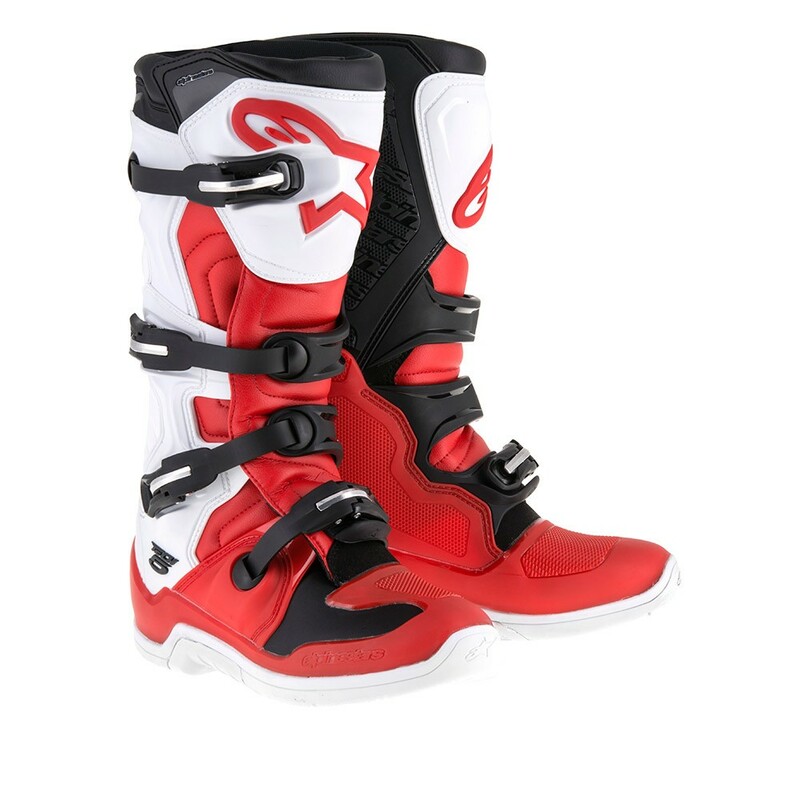 • Rear TPR gaiter on top of the TPU calf protector gives protection and comfort. • Innovative buckle closure system incorporates polymer and fiberglass buckle arms and high-impact aluminum bridge closures for durability and weight-saving. • Buckle system features memory and a quick release/locking system with self-aligning design for easy, precise closure and improved riding performance and security. All buckles are easily replaceable. • The TPU buckle straps are ergonomically profiled to promote high levels of front flexion. • Exclusive dual compound sole is seamlessly integrated to the multi-density foot base structure with built-in support. The sole offers superior durability, grip and feel while riding. The sole is replaceable. • Replaceable anatomic EVA footbed with textile lining on top.